How is your decorating coming along? Do you have your tree finished yet? 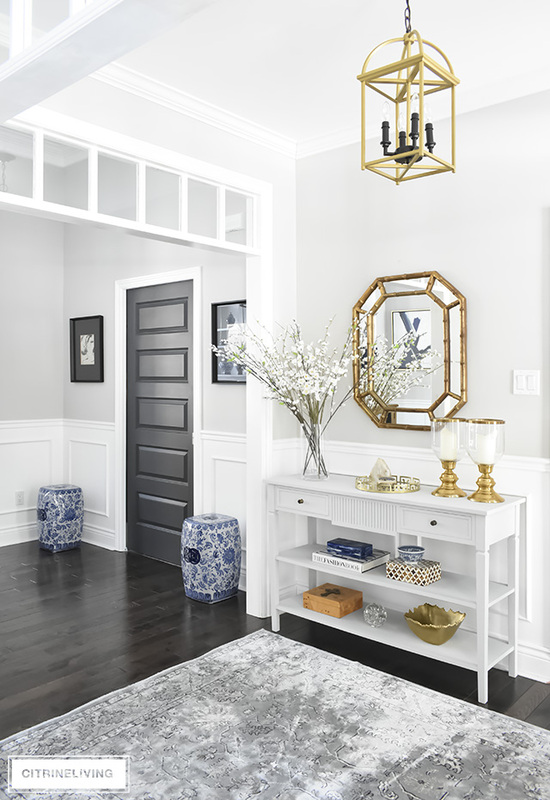 How about your mantel, if you’re decorating one? 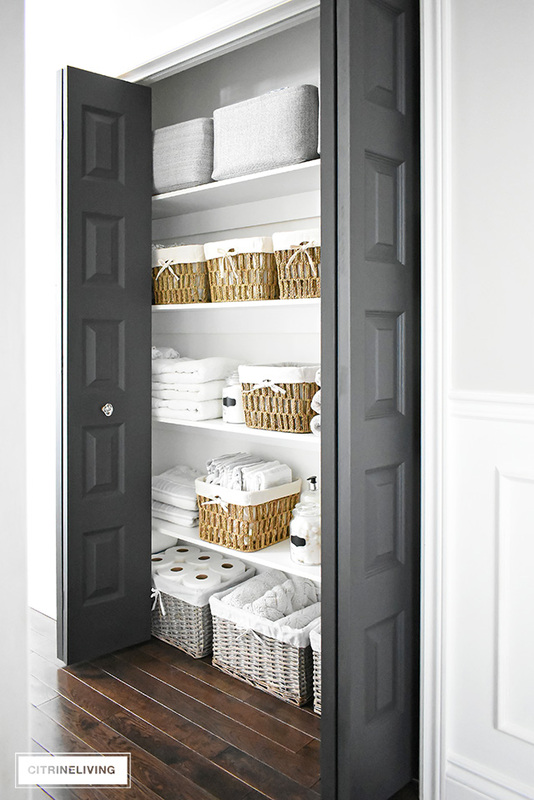 Your porch and entryway? I finally finished our tree two days ago and have to say I’m exhausted! 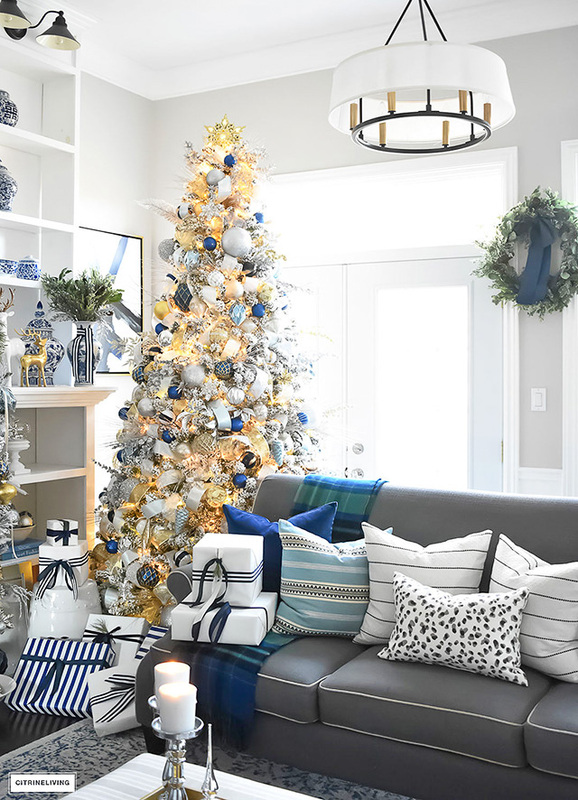 I’ve been decorating our home now for about three weeks, maybe even a month and I can finally say I’m finished tweaking and primping, fluffing and twisting, tying ribbon and moving things around the house about 5000 times. Not to mention the six thousand trips to HomeSense and Michael’s, buying, returning, buying again, returning again, exchanging, you name it! The joys of holiday decorating, right? Ah but I love it! 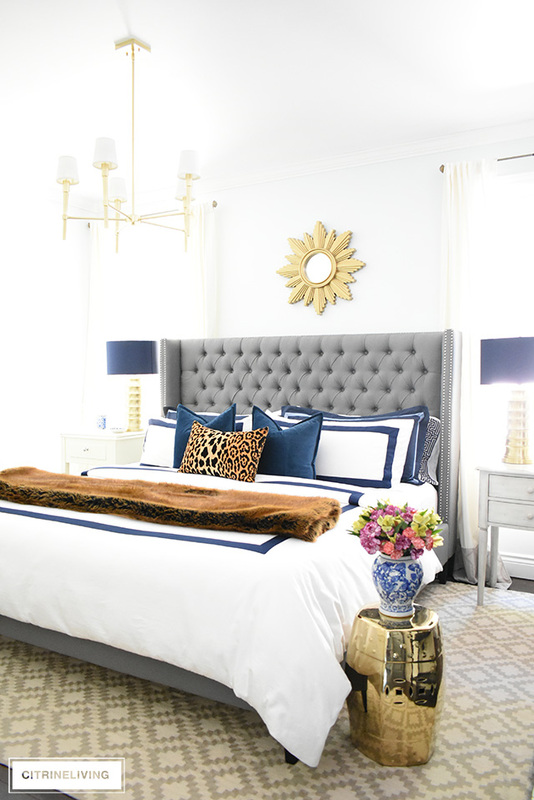 No complaints over here, and although I’m still not ready to share my full home tour just yet (it’s coming, soon, I promise! ), I wanted to share our tree with you today. You’ll see a few peeks of the living room, but that’s about it for now. So please, be a little more patient with me, I will get there, I swear! 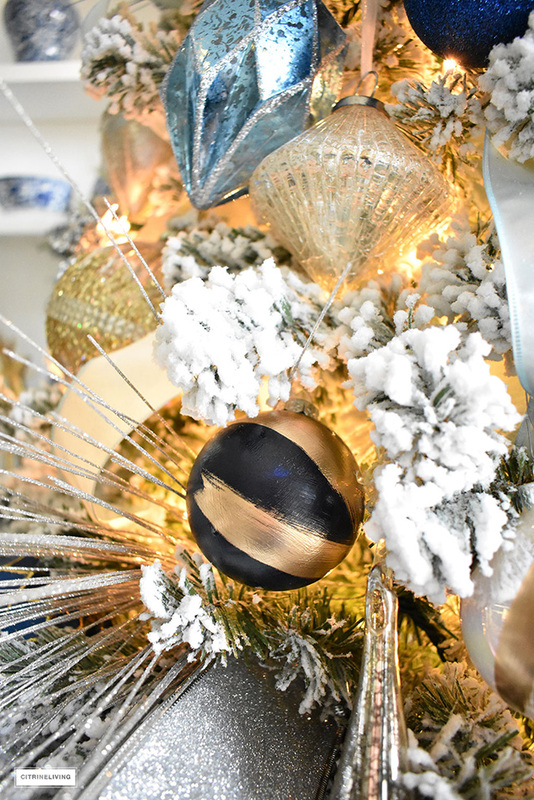 This year, I decorated only one tree – I don’t even know how my blogging friends with multiple trees, pull it all off each year! My hat goes off to them, because I’ve only done about one tenth of what they do, and I am pooped, people! 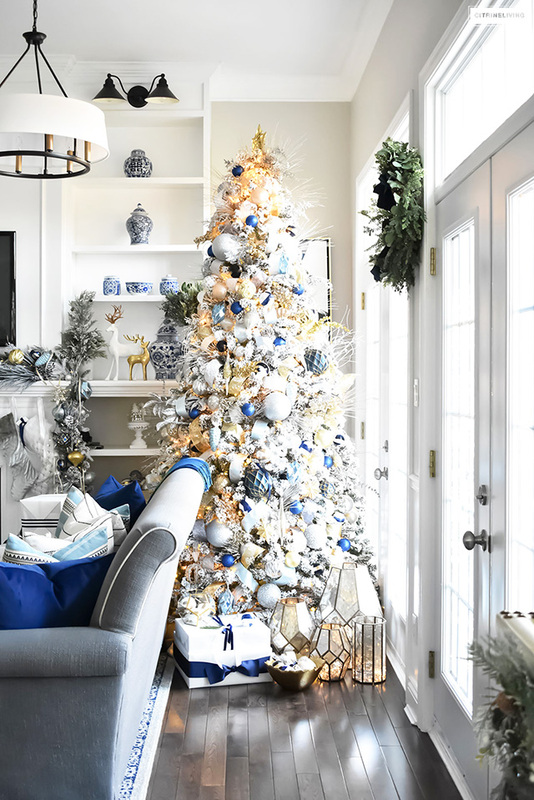 That being said, no matter how much work it is, getting it all done so early, allows us to enjoy our home all decked out for the season – everyone is in the Christmas spirit and I’m thrilled that my hubby and kids love our decor this year. If you haven’t had a chance to see my inspiration post outlining my theme, you can read all about it right here. 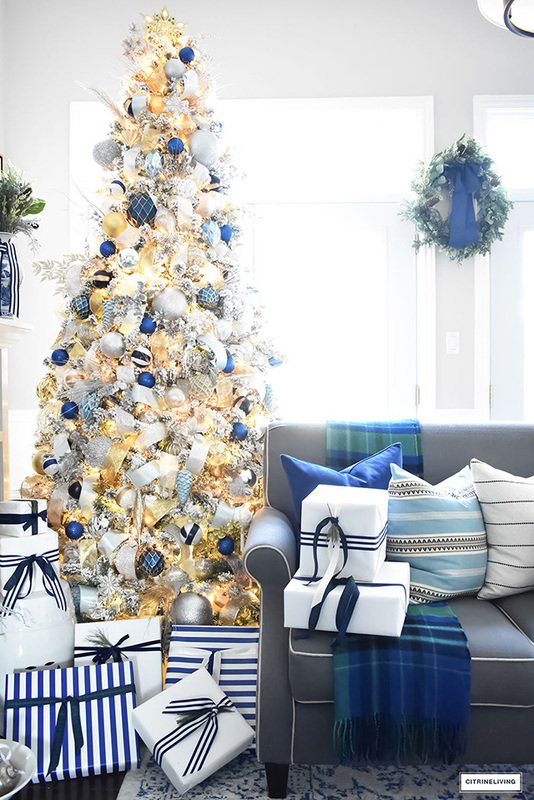 Navy, gold, silver, with touches of tartan, stripes and light blue are what you’ll find throughout our main living area this season, and being the blue and white lover that I am, I think this is my favorite Christmas theme to date. I always use metallics and I usually have touches of blue or green, but this year I went full force and am loving it! 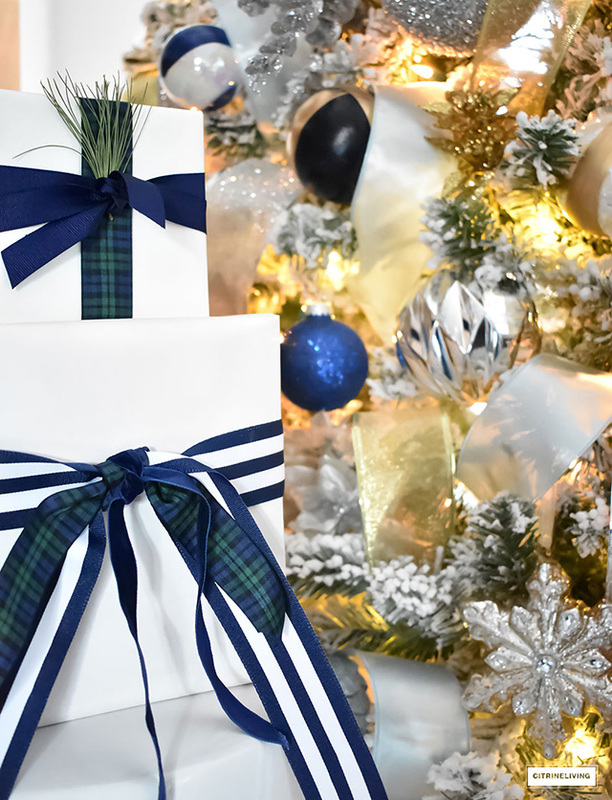 The gift wrap theme I chose this year is modern, clean and simple – I wanted something crisp and refreshing, so I decided to go with a blue and white palette – with a focus on white wrapping paper, and navy, striped and tartan ribbon to compliment our decor. 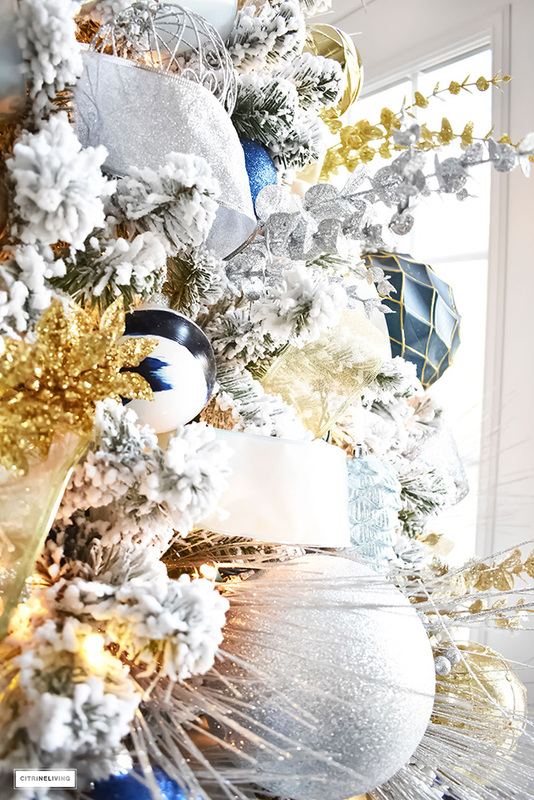 Last year, my theme was icy blue gift wrap that compliment mostly neutral metallics throughout our home. You can catch that home tour here. This is the second year I’m using a ‘faux’ flocked Christmas tree and I am as happy this year as I was last. Being a blogger and having to put a tree up so early, a real one would never make it all the way to Christmas. 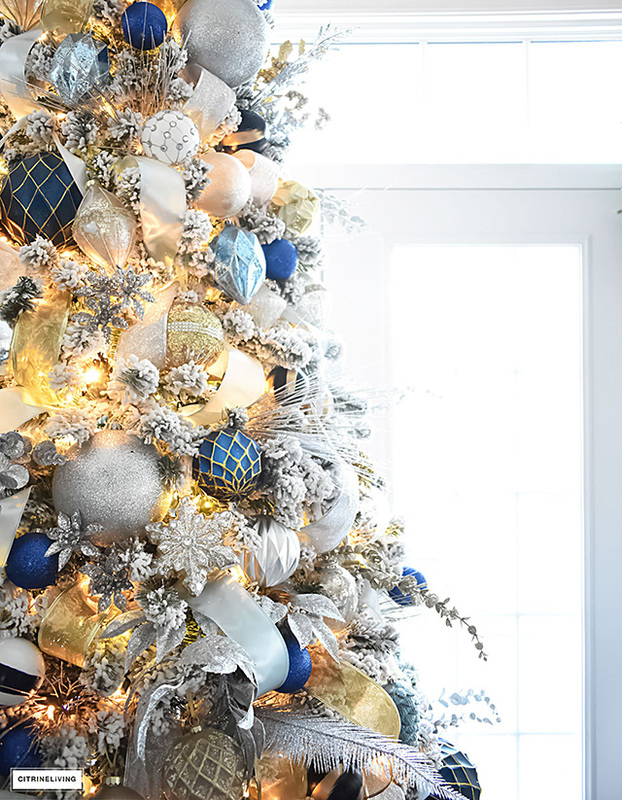 There was a time you couldn’t pay me to use a faux tree but now it’s my lifesaver! There are so many beautiful choices out there too. Definitely not the fake trees of Christmas past! I love the snowy branches and how bright and happy this tree feels in our home. 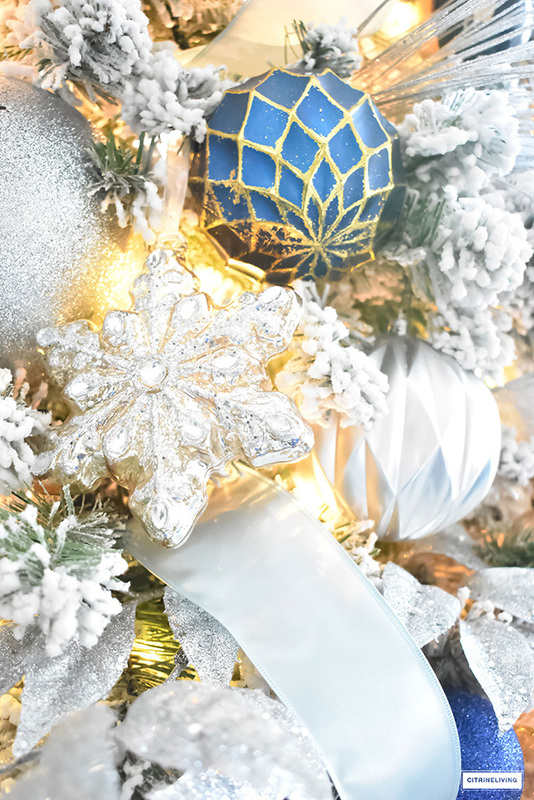 The blues are just beautiful against the white, and the gold and silver almost glisten. 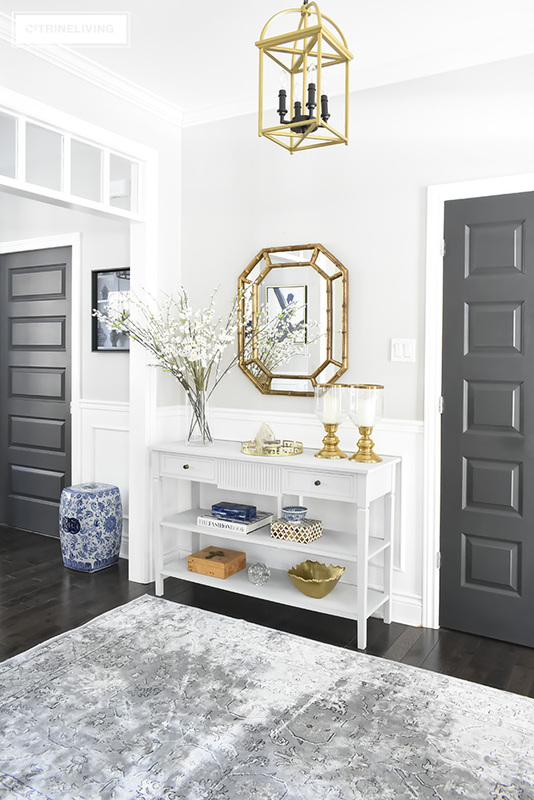 You may recognize the large navy and gold ornaments – they’ re the same ones I used in my dining room, tied to the backs of our chairs (see it here). I also used them to decorate the mantel. You’ll see more of that soon, I promise! 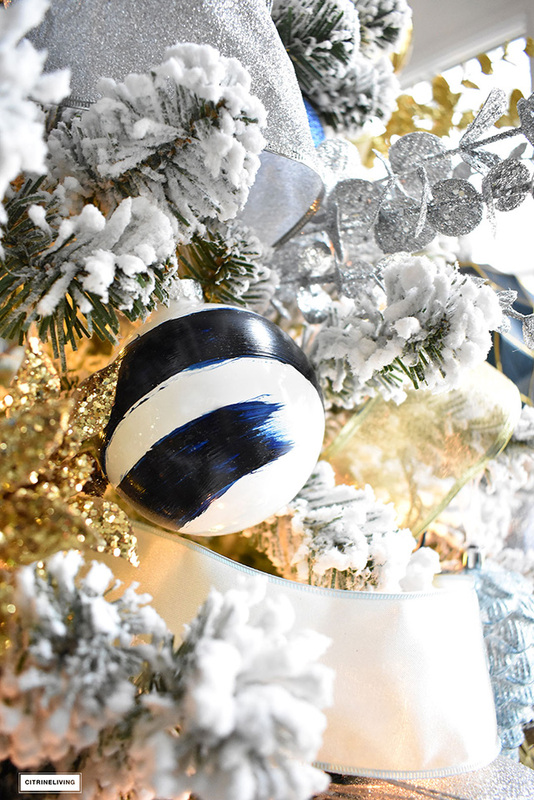 This year, I was very fortunate to be contacted by a truly fabulous artist, Kristen Tirney (see her work here), who sent me these gorgeous hand painted brushstroke ornaments in three color variations – gold on navy, gold on white and navy on white. 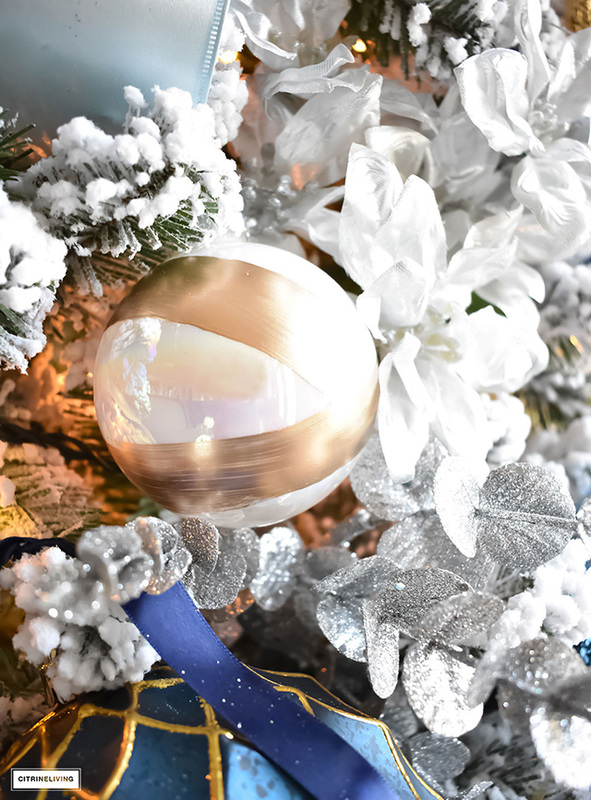 They are so beautiful and I love the modern mix they bring to my more traditional decorations. 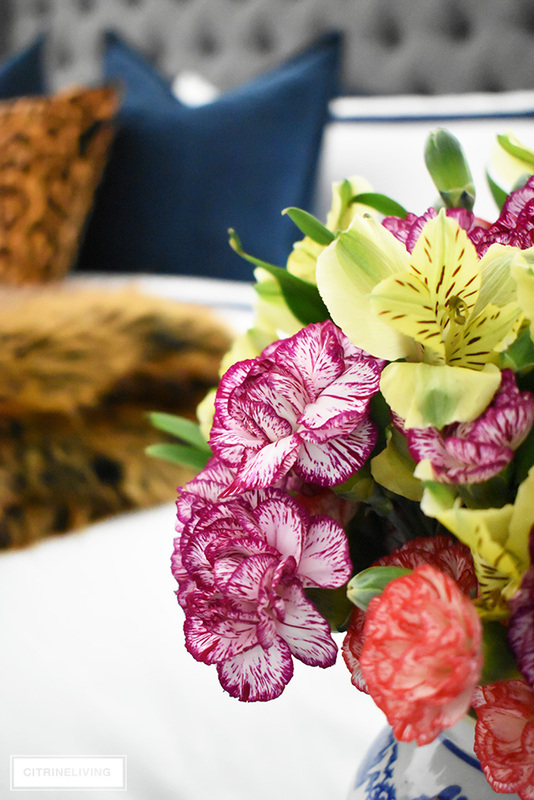 They’re so pretty mixed in with my classics too, don’t you think? I love how they compliment my theme and my gift wrap too. 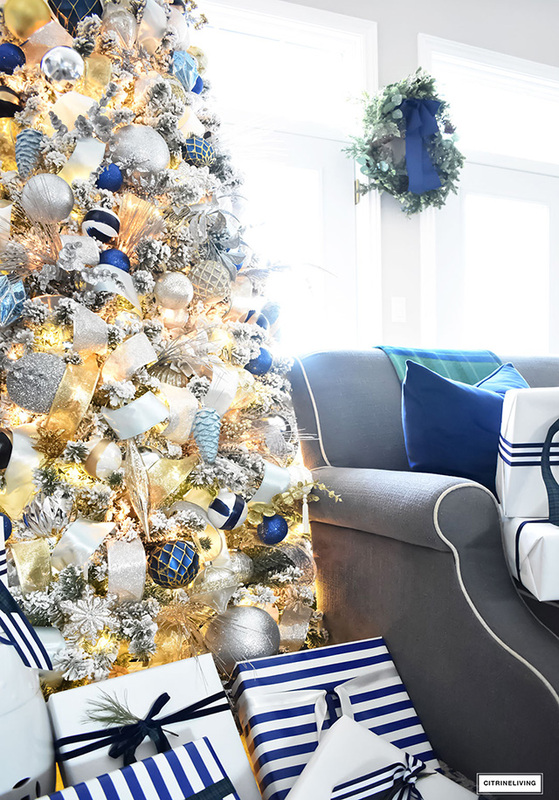 I love to see those navy brush stokes pick up the striped ribbon and gift wrap. 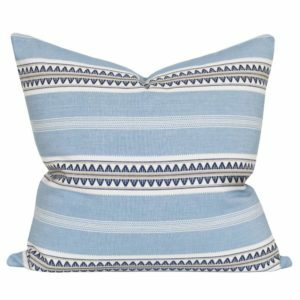 You’ve seen a few peeks of my new pillows in my inspiration post, and you’ll see more of them in my home tour, but here’s another peek and I have to say they are SO gorgeous! I love the wintery vibe they bring to our home. 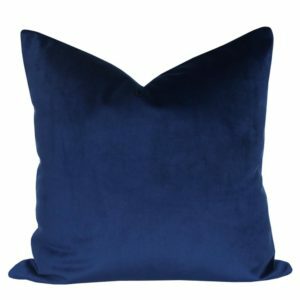 You can shop them below, just click the links to see them. 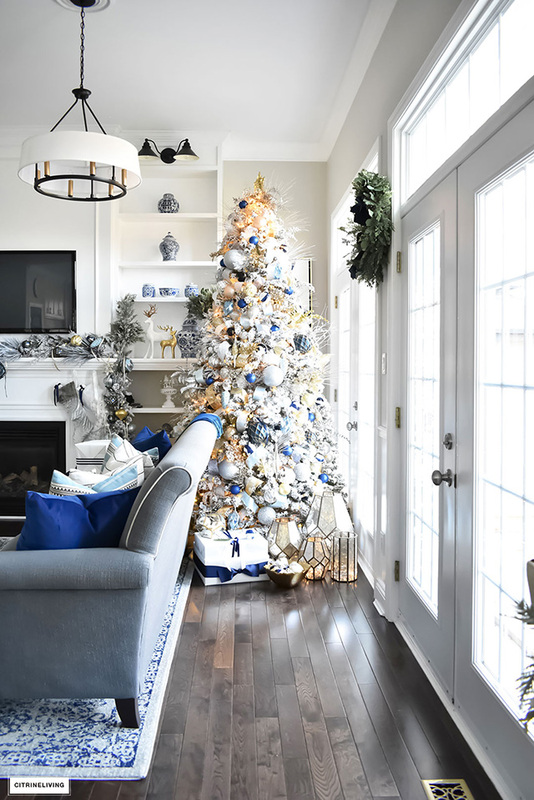 I think a month’s work of hard work was well worth the outcome – I love our Christmas home this year, and I hope you do too. PIN THIS IMAGE BELOW FOR LATER! 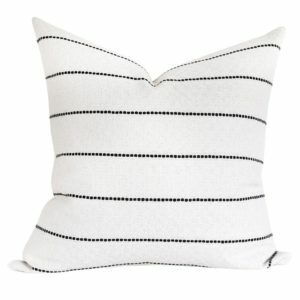 STRIPES, STRIPES, STRIPES AND MORE STRIPES! 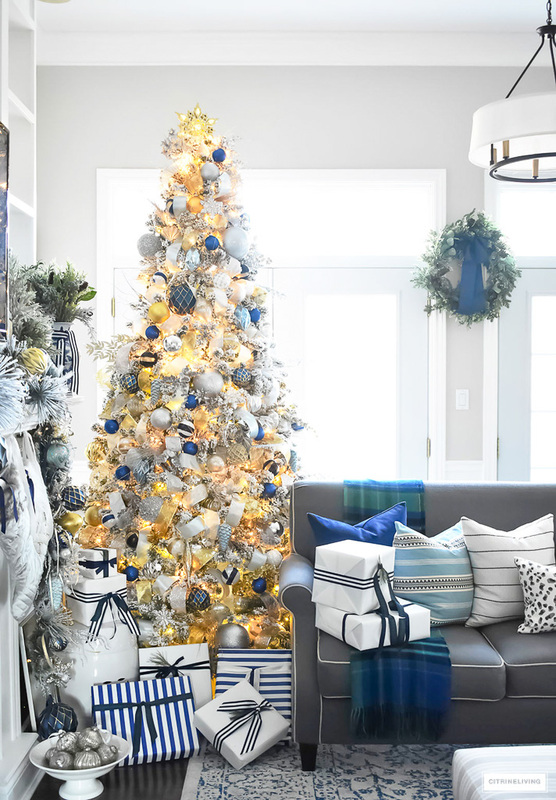 « CHRISTMAS DECORATING AND STYLING TIPS FOR EVERYONE! 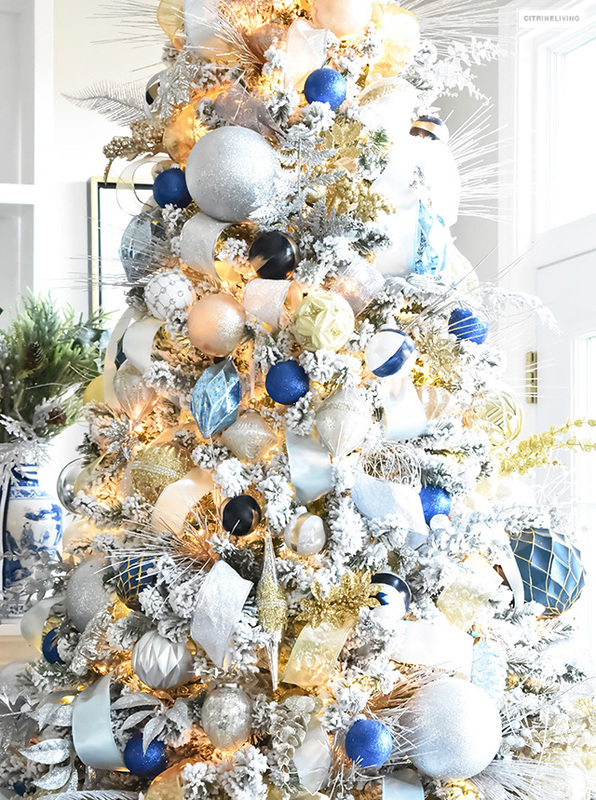 Your tree is a work of art! The color palette is spectacular. The whole concept is fresh and exciting. Amazing!! Linda, thank you very much, that truly means so much to me! It’s definitely a labor of love! I’m so happy you like it, thanks for stopping by to say hi! Absolutely stunning! I look forward to the complete tour. Thanks for the inspiration! Don’t feel bad; I’m still decorating too. Thank you Tonia! I am thrilled you like everything! It has been tricky pulling all of this together this year, but I’m so happy with the results! Thanks so much for stopping by! It looks so beautiful!! The tree is spectacular. 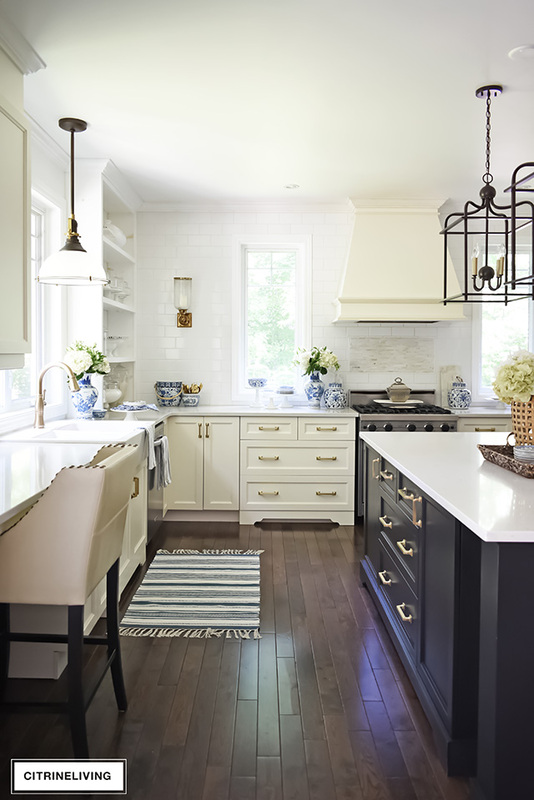 Blue and white is my absolute favourite. 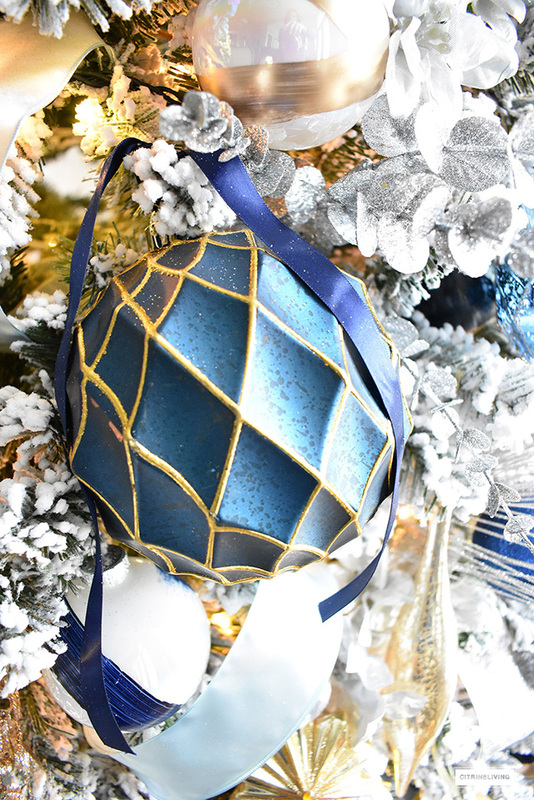 I was going to do a similar colour them this year but I had such a hard time finding blue decorations! So I went with pink and gold…..should have stuck with blue…i am not finding pink either. LOL Heading to ribbon and box store this morning in the hopes that I will find SOMETHING that i can use. I’m in LOVE! I always need a cup of coffee in my hand when I stop here. I take my time to read you and I enjoy every detail. Tamara, you did it again! It’s the MOST WONDERFUL tree I’ve seen around the blogosphere. So refreshing! 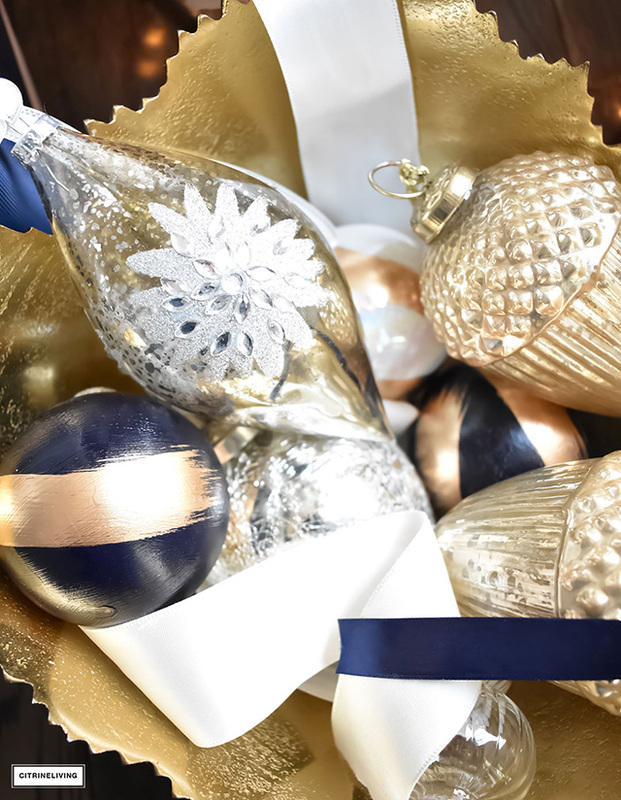 Every ornament it’s in a great harmony. BRAVO! Anastasia, that is the nicest compliment, I can’t tell you! It truly means so much that you love to come here, I’m very grateful! Thank you SO much for the kind words, I’m thrilled you like everything!! Merry Christmas!! With a tree that stunning you don’t need multiple trees! Great job Tamara! Love the blue and green accents 💙💙💙! Can you give us some tips on how to make the tree so pretty (it looks stunning, by the way). Start with _____, then _____, then add ____ . 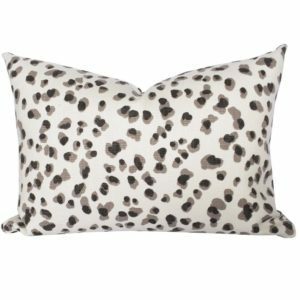 Do you buy a ton at after-Christmas sales? Artificial trees have come such a long way. Your tree is just beautiful Tamara! 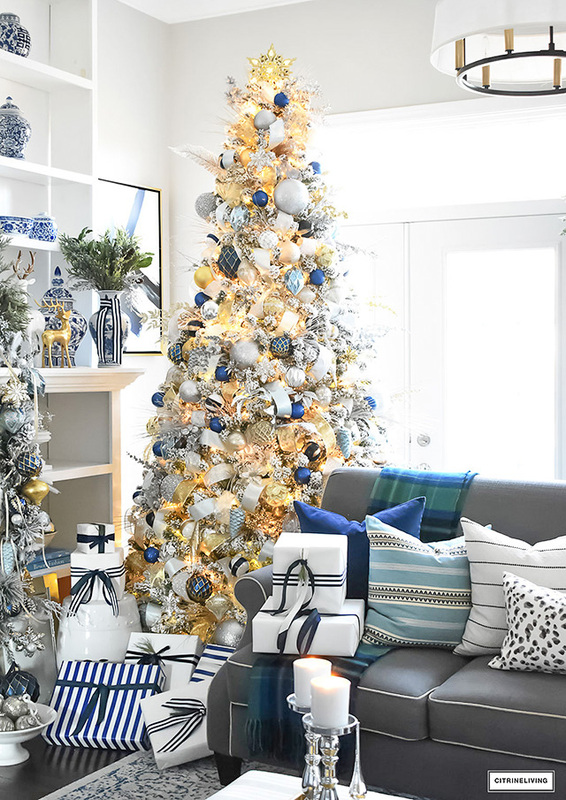 All that metallic and navy and tartan!! Love it all, and hope you and your family enjoy it and the Christmas season! Lisa thank you so much! I am thrilled that you like it all! So happy you stopped by to say hi! Merry Christmas!! 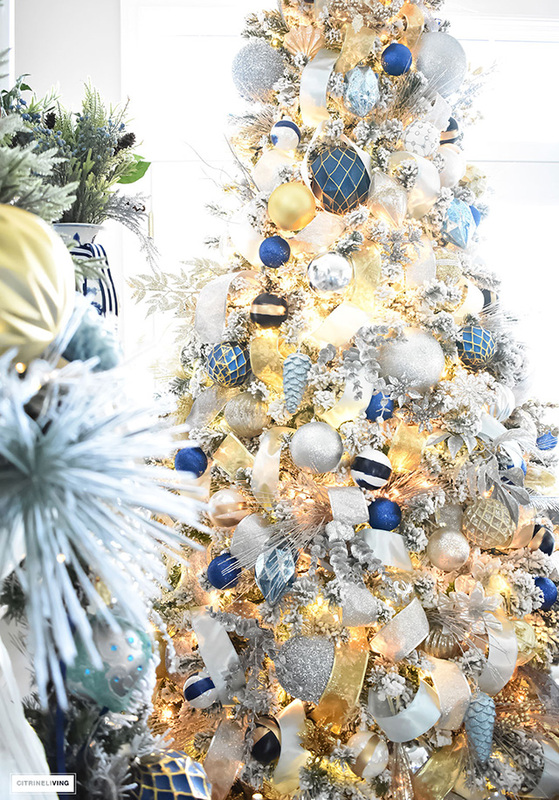 Love that it all ties into the classic blue and white which is your signature! So glad I found your blog via Instagram! I love the navy, gold and green theme. 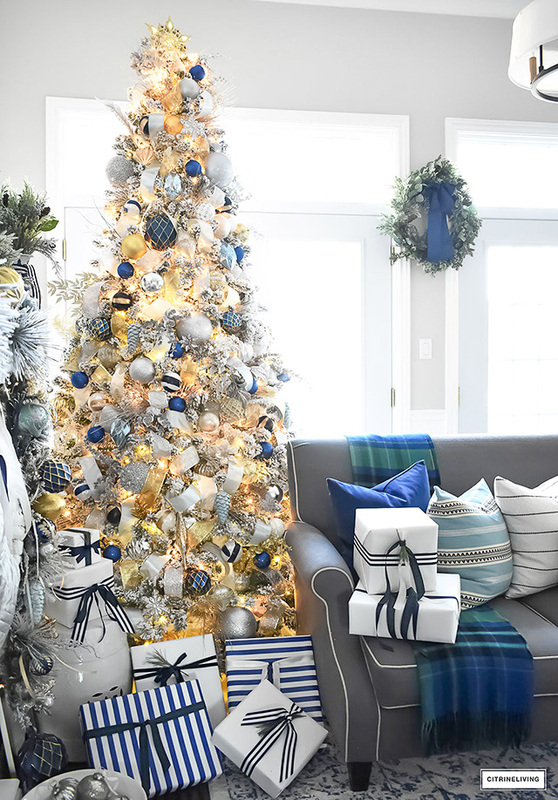 Could you please share the brand or where you bought the oversized mercury glass navy and gold ornaments that are on the backs of the chairs and on your tree. Thank you!! !